I recently got to help my friend Mike Abrahamson get his board game prototype ready for playtesting at PAX South. PAX South is a large gaming convention held in San Antonio Texas every year. About 1/3 of the convention is made up of tabletop gaming and Mike was excited to show off his press your luck dice board game in the Unpub area. Unpub had several tables set up where game designers like Mike and I could bring our own unpublished board game prototypes to test out with players passing by. I was amazed at the amount of room they had (convention space can be expensive) and thought it was really nice of them to offer this amazing free service to us. If you get a chance to attend one of their events, then you should. It is a lot of fun and you get to meet a lot of cool like minded people that enjoy making board games. Unpub and PAX South ended up being such a success for Mike that we were both excited and thought we would share the experience with you. So this post is somewhat of a mini interview that focused on Mike’s preparation of his board game prototype and the actual experience of having playtesters at PAX South. 1. How many hours did it take you to prepare your board game prototype for PAX South? It’s really hard to count, but I will say the trick was just doing it. I didn’t worry about making it perfect, just making it playable. I then ended up making a lot of adjustments the few days before to help balance the game. If I were to guess just time spent physically building the prototype, I’d say I put about 5 hours into the original prototype and then about 10 more hours adjusting things the week before PAX. As far as time thinking through changes, there’s really no way for me calculate that. The game is always on my mind. For example, after our initial presentation day, I was up until 2 in the morning trying to figure out how to make the cost of manufacturing manageable. This was due to the feedback I received from several people saying the cost of making 78 dice per game would be too expensive. 2. What were some unexpected challenges you faced for prepping the prototype? There was a lot of last minute adjustments that happened the two days before PAX that I just didn’t see coming. I also didn’t anticipate the positive response or need for sales sheets or signage. I showed it Friday, then spent Saturday prepping sales sheets and the whole social media platform, and then showed it again Sunday. A ton of card sleeves to keep everything clean and feel professional. I also brought sharpies and extra cards with me, which was good because I’d missed a couple things in my last adjustment of the game. 4. How did the players seem to like the looks and feel of the prototype? Overall, people didn’t mind how hand written everything was. I was really concerned that it might be an issue, but everyone understood it was just a prototype. It was actually really nice to see the reaction. Of course you have a few people walk by and sneer at it, but they kept walking anyway so they weren’t my audience. Staying positive was super important. 5. What did publishers say about the cost of publishing a game like you had? In general, the publishers I talked to (one in person, one via email) seemed to concur that dice can be expensive, but that at scale it’s not so bad. There was a drive to simplify. The best advice I got was was a question someone asked me. “Can you justify every single component”? I’ve been working through this since and found many ways to help simplify the game and bring down the overall cost of it. 6. How well do you feel the playtesters responded to your board game prototype? The response to the prototype was better than I could have hoped. I was able to add several followers on my Twitter and the 10,000 Goblins Facebook page and I also got some really nice compliments on the game there in person. Obviously there were comments about the art needing to be improved (which is normal for a prototype), but the game play was generally okay. There’s certainly room for improvement, but it’s working much better than I could have hoped. I had people asking where my Kickstarter link was and how they could get updates and I hadn’t gone in expecting to need any of that! I went into the convention thinking “maybe no one plays it and that’s okay”. This helped me set realistic expectations. I would like to note that it took about 15-30 minutes before I managed to attract anyone to the game. Playing it actively with a friend who was helping me was what started drawing people in. If you’re just standing around a prototype not doing anything, people don’t see something fun happening. If they see people playing something and having fun, they’ll stop and then you can bring them in or offer your seat and let it go somewhere. Playing it ourselves was the single best way we brought people to the table. Have you had to prepare your board game prototype to playtest at a convention? Thanks for retelling the story for everyone Mike. I want to restate that it took him awhile before anyone came to play his game (15-30 minutes). And that is okay because it can be hard to find playtesters for a prototype even at a crowded gaming convention like PAX South. 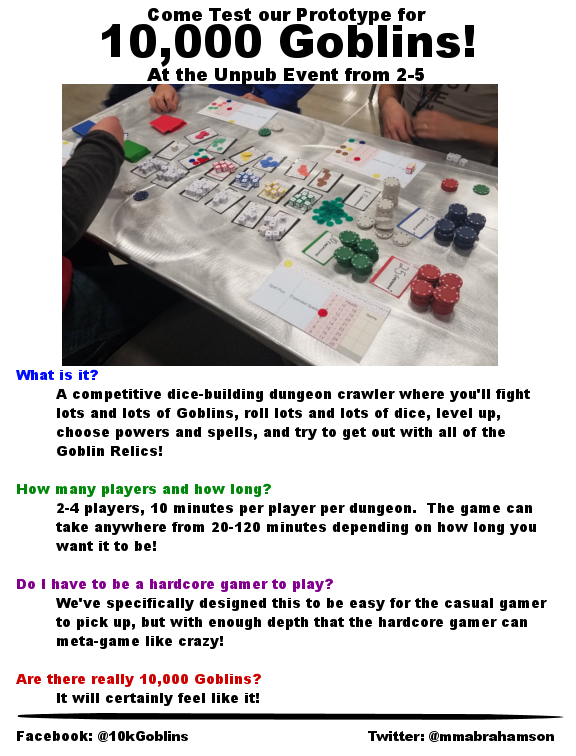 So if you are new to testing your board game prototype at a convention, just know that it is normal for it to take some time to find players. But don’t get discouraged (especially if you have a friend with you). Start playing your game with someone like Mike did and that will draw in a crowd. If you have prepared a board game prototype to playtest at a game convention, what has worked well for you? Or maybe what didn’t work well that you thought would? Let me and other board game designers know in the comments below so we can learn from each other. Thanks for helping us build a welcoming community of game designers. Hi Calvin! This is really helpful for getting my game prototype ready to playtest as well. I’ll be at PAX East in a few weeks and it looks like Unpub won’t be there — do you know the rules for playtesting in the Tabletop area without a dedicated space? Do you think they would they have a problem with me inviting people to join me at one of the open play tables by word of mouth? Thanks! tl:dr – I don’t know the rules for playtesting in the Tabletop area but have had a friend get some good playtesting in at PAX South last year. I think you should be good and if someone asks you to stop, then apologize and stop (but don’t let it ruin your weekend. haha). My friend had a booth at PAX South this year but last year he didn’t (not Mike, but a different friend). And last year I know he was able to get some playtesting done like what you are trying to do. At PAX South there is a section of tables in the Tabletop area that are used for people to play games and relax. I assume there is a section like this at the PAX East Tabletop area as well. This is where he was able to find some playtesters. I would guess if they did have a problem with it they would just ask you to stop. But I don’t think they would unless you were treating it like your own booth (which I don’t think you would). 1. Try to find people to play your game as if it were a game that you bought at PAX. Meaning keep it casual and treat the experience like you would playtesting your game with your friends. 2. You can tell people it’s your own prototype, I am just saying that you might not want to promote it as if your table is your own booth at the convention. Because that would upset the people that do have a booth (again, I don’t think you would do this. I’m just clarifying my first suggestion). 3. You might also try finding some new friends while demoing other games. And then when you are done with that game, ask them if they want to try your own game. This is a lot of work and time so it might not be worth it. But it’s a suggestion. Hope some of this helps. Let me know how your playtesting goes at PAX East. I’m interested to see! You just made my day, Katie. I’m more than glad to hear that people like you are benefiting from our hard work. It will be nice to look back on.when you get home. Also, if you have a great experience and want to talk about it in an upcoming blog post (similar to this one), I would be more than happy to hear about it! If you are interested, you can email me at calvin AT streamlinedgaming DOT com. Just thought I’d offer. Good luck at PAX! Hey Katie. My friend Gerald that I met at PAX South Unpub this year just informed me that Unpub announced that they ARE going to be at PAX East. You can signup for a time slot to demo your prototype to players passing by like Mike did in the article above. Also, at PAX South this year there were a lot of empty spaces in the Unpub area. So you might be able to test your game at other times as well (though I don’t promise that is the case). Hope you see this in time and good luck! That’s perfect, I’ll get in touch with them soon! Thanks so much for the update – I’ll be sending you an email soon as well! Your welcome. I’m glad you saw it in time!